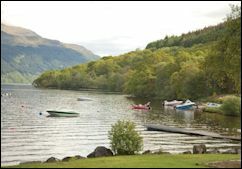 Ideal for activities including boat trips, watersports, golf and walking (close to the West Highland Way). Historically associated with Rob Roy, now part of Scotland's first national park (The Loch Lomond & the Trossachs National Park). Loch Lomond is the largest expanse of fresh water in Britain. Choice of caravans, cottage or lodges. Lodges from £299 per week. Stunning location on the shore of Loch Lomond. Purpose-built pine lodge with wonderful views. 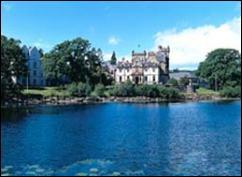 Only 30 minutes drive from Glasgow city centre. Beauty treatments, Reiki and massage. quad-biking, clay pigeon shooting, etc. nearby. Facilities for weddings for 80-300 guests. Choice of different bedroom styles and suites. ensuite bath & shower, TV, sofa, phone, hairdryer. Some with private sauna & balcony. Plasma TV, DVD player, leather sofa, living flame fire, etc. Room prices from £57 per person (2 sharing). overlooking the picturesque village green in Drymen. Ptarmigan Bar with malt whiskies and bar meals. Live Scottish music on certain evenings. Choice of bedrooms (single, double, twin, family). All with satellite TV, telephone and tea/coffee. Superior rooms can inclue balcony or patio. 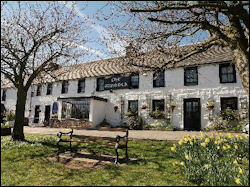 B&B prices from £32 per person. 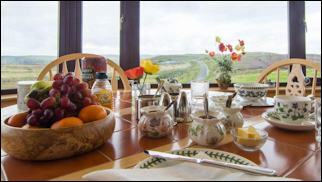 with views of the Campsie Hills and Endrick Valley. Ideal location for walking, cycling, fishing, golf, boat trips, etc. Scottish Tourist Board 4 GOLD Stars. 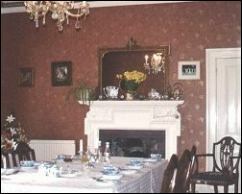 Dining room with antique furnishings and spode china. Sitting room with a log fire. 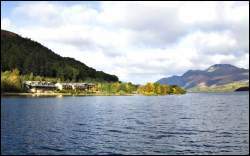 Loch Lomond Seaplanes - see the loch from the sky!